I love my car. It fits me. We've been traveling for nearly a month already, and when we travel as a family we go in Steve's car - it's bigger, and since he prefers to do all the driving it just makes sense. But we needed to drive separately to Lancaster for this week's festival, for complex logistical reasons that need not be discussed here. 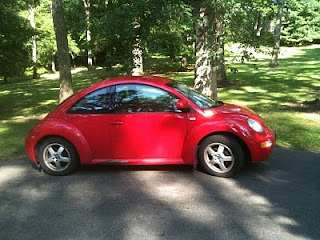 Getting back into my little bug all by myself was just so freeing! I love my car. It is zippy and responsive. It's a stick shift, which makes me feel powerful and makes good use of my busy energy. The seat and all of the controls fit me just right, and the steering wheel is skinny and nubby and spins easily under my hands. The car speeds up when I push the gas, and roars encouragingly when I shift from gear to gear. It operates in a satisfyingly mechanical way - although I know it's full of computers like every other car I am not aware of them while driving. I can feel the road and hear the engine, and when I have driven cushier cars I have always felt a little isolated from the world. Comfortable, certainly, and able to hear the stereo - but disconnected from the driving experience. 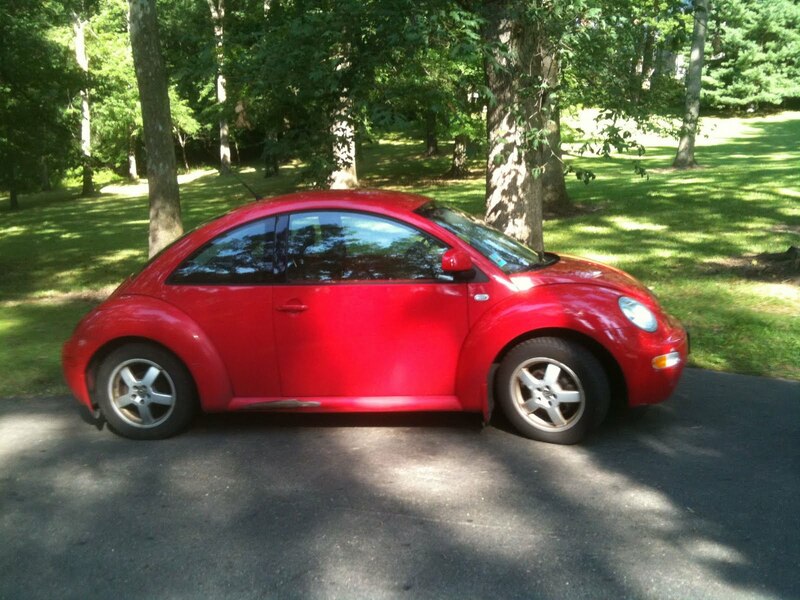 On the outside, my Beetle is overtly adorable - it's red and round and makes me smile every time I see it, even after all these years (I've had it since 2003). Other people smile at it, too. However, if you look a little more closely, you can tell that my car has been around the block a few times. The bumpers are scuffed and scarred from years of parking on Chicago's streets, and there's a substantial gash in the paint below the passenger door where I might have slightly driven over a curb once. It has 179000 miles on it, give or take. It is cute enough to be forgiven a lot, but happens to also be very basically reliable. My car has given me almost no trouble at all. I change the oil and the tires, and it just keeps going, and I just adjust to its quirks. For example, the outside temperature gauge no longer works, so the dash display usually looks like --- but occasionally pops up as -49F which is always amusingly wrong. The climate control knob is installed backwards, so the arrow end has to point AWAY from the thing you actually want it to do. The lock button on the remote only works in cold weather, and the alarm tends to reset arbitrarily as I am loading myself and my stuff in so that it starts honking like crazy when I turn the ignition key as if I were trying to steal the thing. Which, if I were going to steal a car, I would totally steal mine because I love it so much.